Foot of the Bed Cellars in the Cave with Dave! I tasted through nearly all my barreled wines with Martin and Luc from Foot of the Bed Cellars in San Francisco. Tasting with different palates and different backgrounds can be much more enriching of an experience than doing all the work in solitude. Don’t get me wrong, I like solitude, the opportunity to block out everything and focus on the task; I always have. However, the inputs from others in a controlled setting are enlightening and the nuances others pick up can be more attuned than my own senses. Take for instance my Merlot from 2017. Merlot happens to be one of Martin’s favorite varietals (I found out that morning). I didn’t really have a planned experiment in mind when we starting tasting the four barrels of 17 Merlot, but it soon became one of our longest discussions of the tasting. I barreled the merlot down to three new oak barrels, Gamba, Kelvin and Nadale and one neutral. The merlot came from Galloway Vineyards in Dry Creek Valley, harvested and fermented exactly the same, so the only variation is barrel time. Many in the wine business use the term ‘American oak’ generically and homogenously, which does the American cooper a disservice. American oak is unique, as is French or Hungarian; as are American cooperages and the craftsmen that work the cooperage. In this micro tasting of Merlot, Kelvin cooperage in Kentucky is an American cooperage using American oak exclusively. Gamba is an Italian cooperage using French oak and Nadalie is a French cooperage operating in the United States using American oak. Quite the combination of styles and raw product, but that’s what can help finish a wine, just as one would use mesquite wood to finish a steak instead of cherry or apple wood. Martin really focused on the Kelvin 36 month medium long Hydra barrel. Kelvin uses a steaming processes during barrel toasting that is incorporated to lengthen the open fire toasting process, thus penetrating deeper into the oak and mellowing harsher oak tannins such as vanillin or the aromatic coconut picked up in many American oak barrels, in the process, greater complexity is achieved for the American oak. I’ve been using Kelvin since 2010 on many a Bordeaux varietal and have been very happy with the results. There are greater baking spice notes, wisps of mocha, and not nearly as much sweet vanilla as you’d get from 24 month Kentucky or Virginia oak. While Martin was pondering Kelvin, I was obsessing over the Gamba oak barrel. I initially put the new Gamba Allier forest oak on my 2017 Lencioni Vineyard dry-farmed Cabernet Sauvignon for about 6 months, I racked it off and took the Gamba and put it on my Merlot to finish. The Gamba is opulent and silky with both the Cabernet and the Merlot. 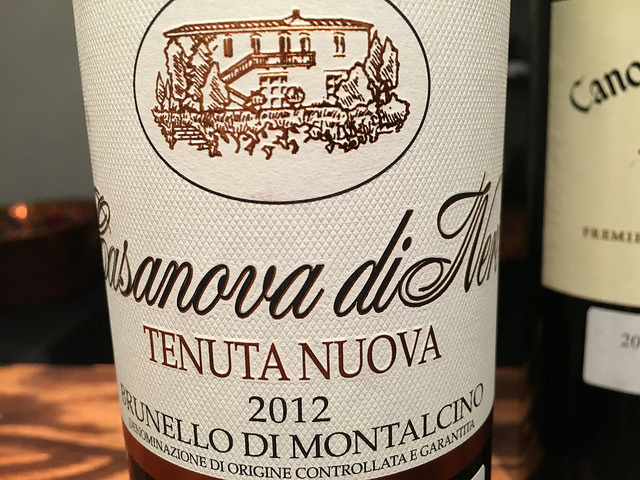 Gamba does pack a punch though, and doing some research on Italian cellar technique, brought me to the idea of using the new oak twice in a single vintage, gradually moving from the strongest varietal, Cabernet, to something with less tannin, Merlot. I’ve even considered using this same Gamba barrel a third time in the vintage and aging some Barbera on it for a few months. The Nadalie barrel was from their proprietary Symphony American oak line. 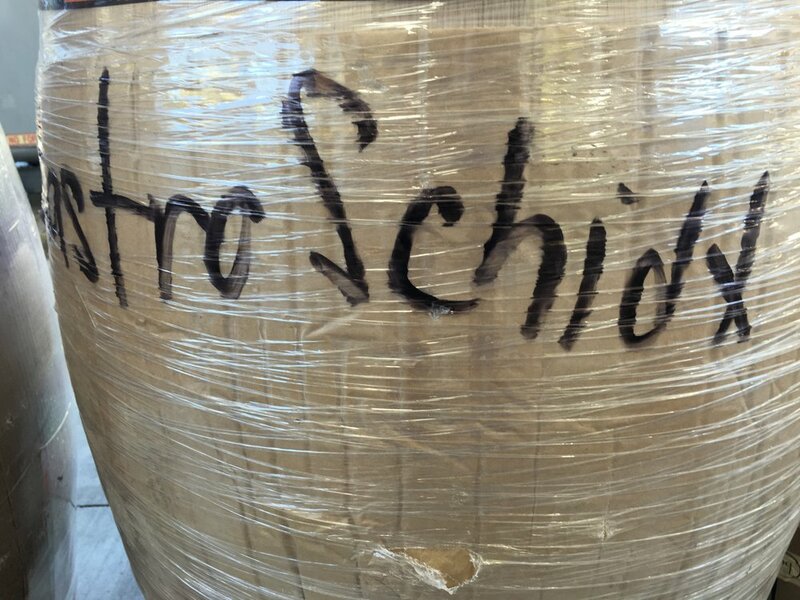 A combination of various American oak forests, the oak is aged in a Pennsylvania yard 36 months minimum, which is the minimum aging that I use for American oak in my program and then final cooperage and toasting is completed in Napa. The barrel is toasted in a long and slow process, just as Kelvin, but without any steam applications. 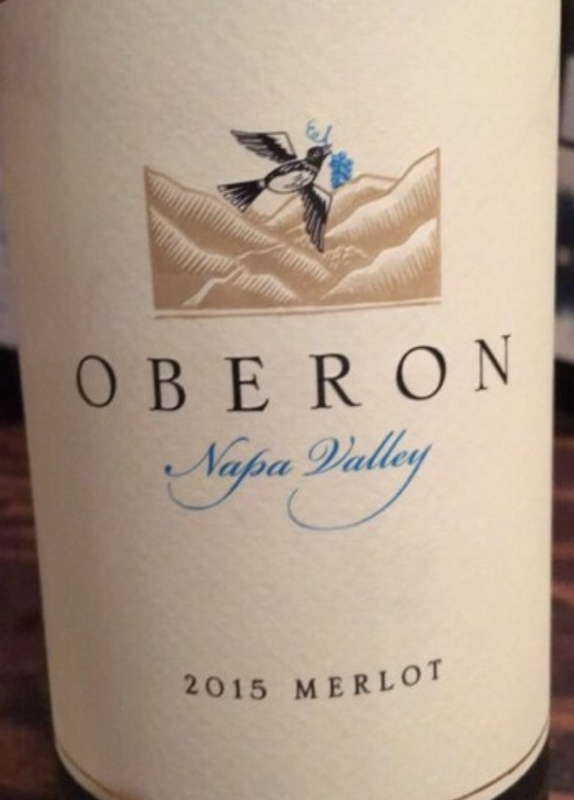 The results on the Merlot show more subtlety of oak on the fruit of the three cooperages, not overpowering the Merlot, but rounding out every edge. 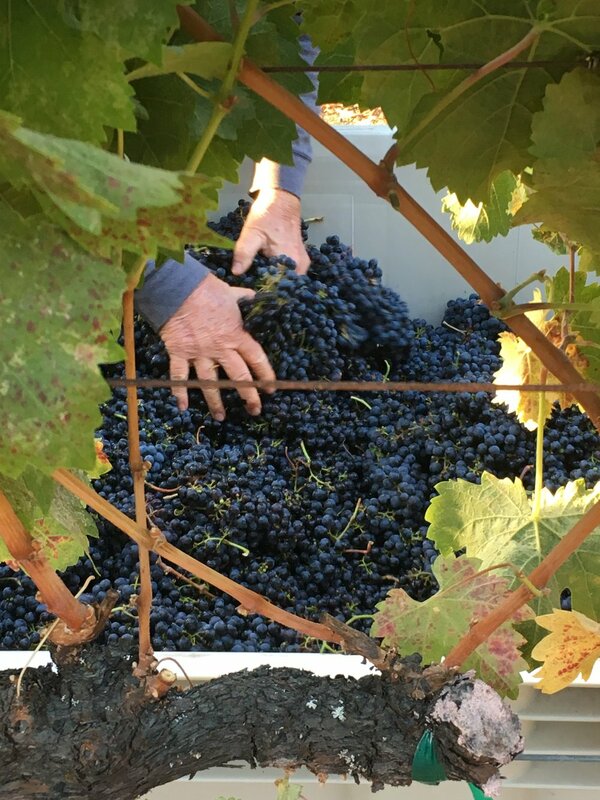 It’s likely that the Merlot on Nadalie Symphony is bound for blending and complimenting anything it’s blended with, especially Cabernet or Barbera. Tasting with different people at various times during the wine aging process gives me a gift of insight I might not otherwise have, noticing nuance. Perhaps tasting with others who appreciate wine as I do also forces me to look at my own barrel program with a more critical perspective, verbalizing the decisions I’ve made and compelling me to make objective judgements about my own winemaking. Wine making is a lifelong learning process of both objective and subjective measures, the clichéd art and science of wine that many aspire to comprehend. Alliteration and Memes are fun to use, so the Maestro Meme Monday was born. You may have noticed some self-depricating humor recently on the Mastro Scheidt Instagram account, depicting me and my father in some photos over the last few seasons. What often makes a meme funny is that the meme is true. I can tell you for certain, the phrases and expressions in these memes are true and have been thought about or said aloud. We hope you enjoy them throughout 2018, every Monday, for Maestro Meme Monday. I talk about the dirty job of making wine every season. 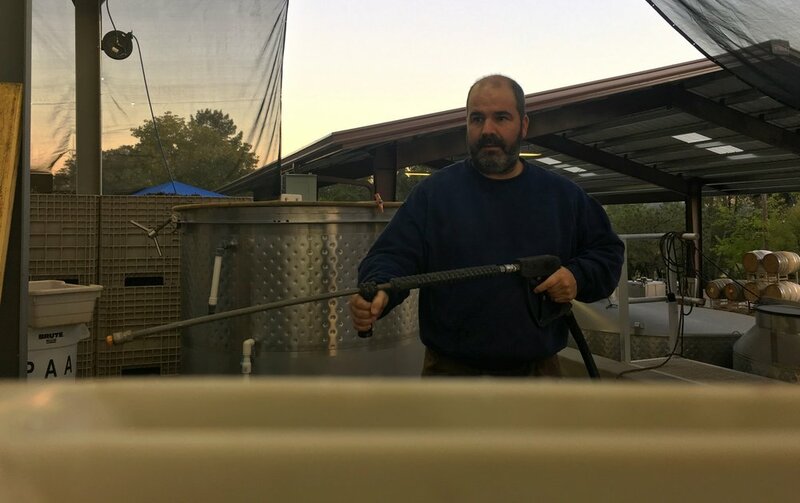 Other than people in the wine industry, no one else sees all the stuff that gets cleaned every day with brushes, pressure washers, hot water, acidic and caustic liquids. All the public sees is a bottle with a cork in it and a really good looking winemaker (like me) pouring it. Behind the scenes of the dirty job of wine making 2017. The shaker table is a tool for sorting grapes. Look at all the debris around the table. These jeans will never be blue again. Like many wine makers and wine drinkers, the belief that “cork is best” for all wines is a conceit. As I’ve grown in both experience and case production over the last ten years, natural cork is not the only wine closure in the marketplace. I made the jump to screw caps several years ago upon the introduction of my Jug program. No one seemed to mind that I used a screw cap for a growler of wine. In fact, the screw cap fit the image of the wine and the growler package. The next use of screw caps were for more traditionally bottled wines, the classic Bordeaux styled 750ml bottle that has had wide success in restaurants, delis, and grocery stores. 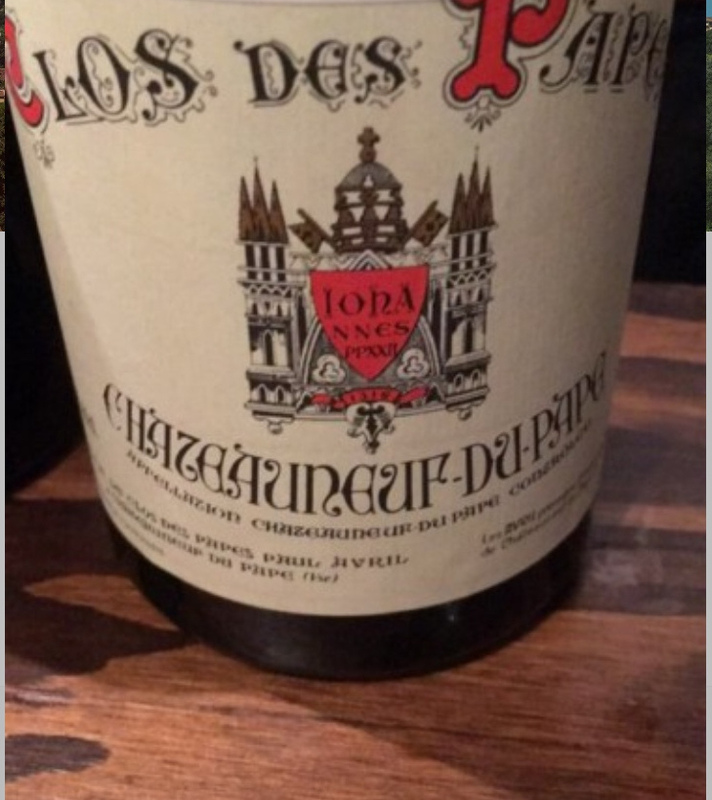 The wines are typically served by-the-glass and easy to open and close in restaurant settings or purchased for nightly home consumption with a wide array of foods. I’ve increased production in the screw cap category, so I don’t see that screw caps have been perceived negatively by consumers. 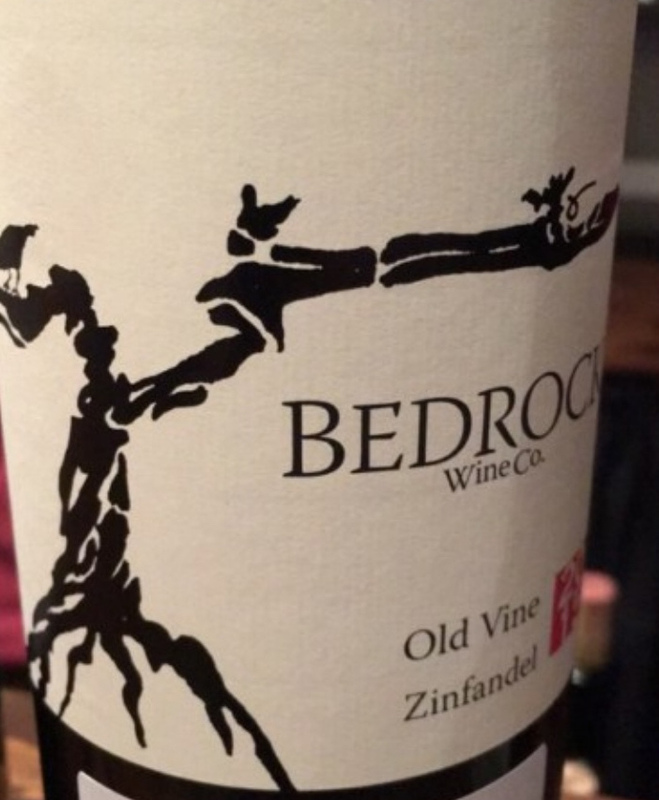 The most recent evolution in packaging is the technical cork. Nearly 100% natural cork, the closure is guaranteed to be free of “cork taint”; whereas traditional cork cannot make the same claim. Secondly, technical corks have been engineered to allow oxygen through the closure over time, similar to traditional cork, which allows for micro-oxidation of the wine, a beneficial characteristic for age worthy wines like Cabernet Sauvignon. Thirdly, you pull the technical cork with the same traditional corkscrew; no special equipment needed. What crystalized my decision to move to technical corks was an experience I had with a restaurant customer of mine. I was pouring a flight of wines for spring and summer at a restaurant in Fresno. When the owner and I got to the second wine, we both knew instantly the wine was corked. Not good. I’m embarrassed and the wine, even if he wanted to pour it in the restaurant, couldn’t be evaluated properly and therefore wasn’t chosen as a finalist. 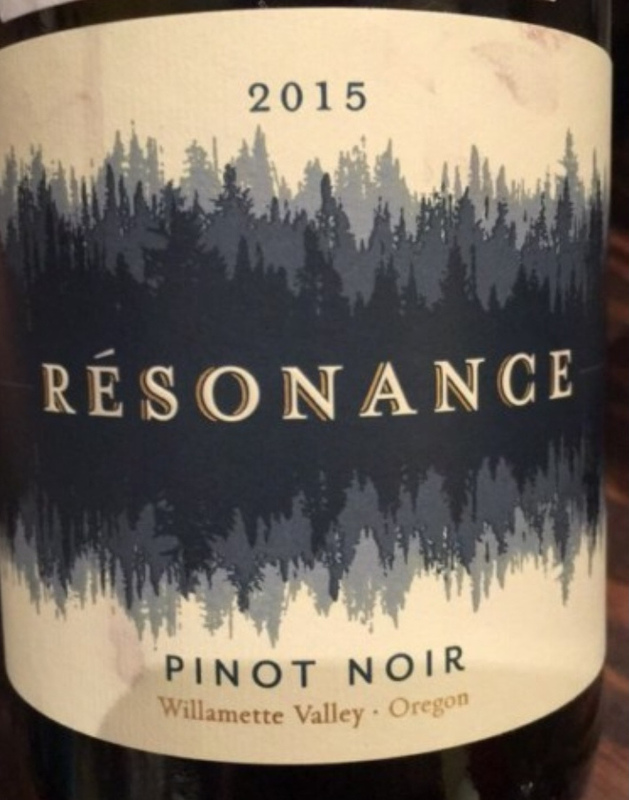 As I’m looking to innovate where I can, I made a partial transition to technical corks with some of my 2015 wines. The main reason for me transitioning to technical corks was zero cork taint. Imagine buying one of my wines for $50 only to open the bottle and find the smell of wet cardboard. Disappointing. With technical cork, having a wine damaged by cork taint is not a possibility. With my 2016 vintage, I should be 100% screw cap and technical taint free cork. It was a big decision to move away from traditional cork. I like the history, tradition and nostalgia of traditional cork. But from a customer viewpoint, the remote possibility of having a flawed bottle of wine because of cork taint in the 21st century isn’t nostalgic, it’s unacceptable. Look for the new corks in my 2015 RWSC label, Superstrada 2015, and Cabernet Franc 2015. A jug of wine is nothing new in my family. Below is a photo from 1976, summer vacation in Aptos, CA. My Dad in the foreground, my Grandma and my brother John in the back; I'm there on the right in the yellow shirt. And in the middle of it all, a big 3 liter jug of red wine with a screw cap. No fancy wine glass, just something to drink with the meal. Let's face it, those old jugs weren't the best red wine in the world or California. They were drinkable. Fast forward to 2016, I've improved the quality of wine I put in my half-gallon growler. The Mastro Scheidt Jug Red Wine is purposely made, not an afterthought or with 'left-overs'. 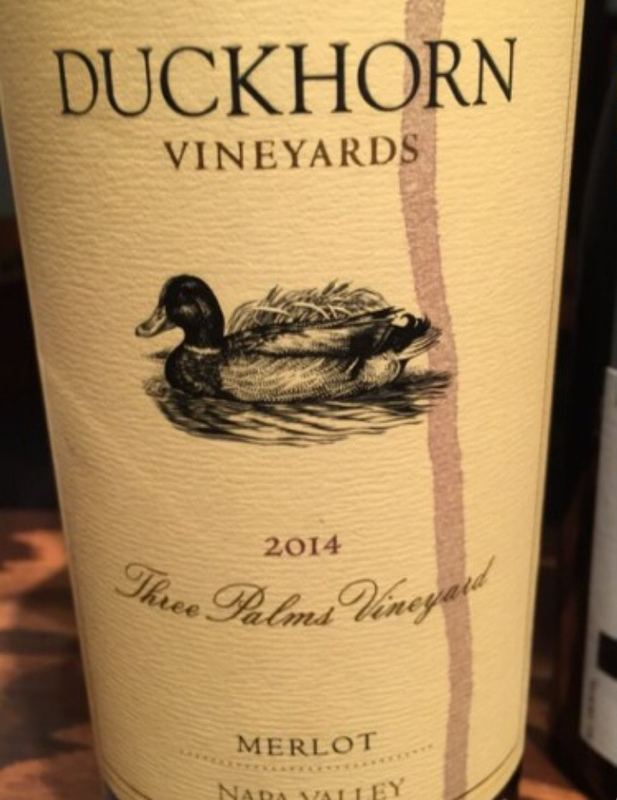 I blend several varietals from Sonoma County to craft an easily drinkable red wine for the entire table. It is bottled unfined, unfiltered, and without additional sulphites. The Jug is 64 oz or 1.89L of wine, nearly 3 normal size bottles. Give the Jug a try. Find it online or at your local retailer in Fresno and Bakersfield. Sorry, no out-of-California sales. 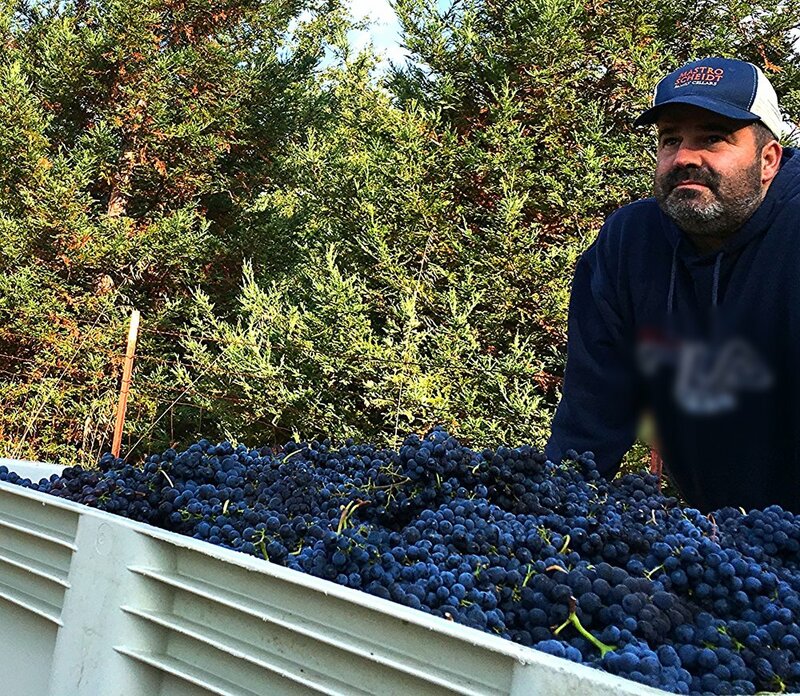 My Mastrogiacomo Rosso is a Sonoma County product, filled with top quality, hand-picked fruit. It's all about the grapes. 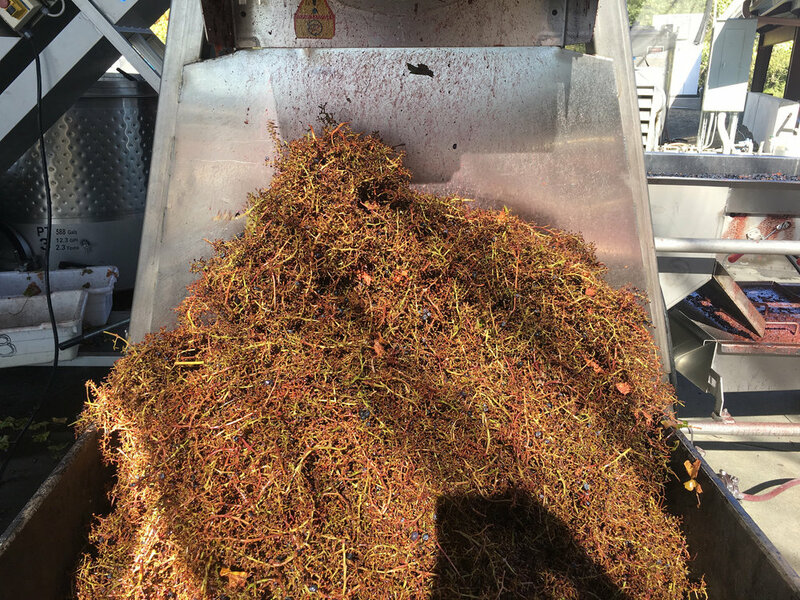 Cabernet Sauvignon, Petit Sirah, Syrah, Merlot, Barbera, Cabernet Franc, Zinfandel, Sangiovese, Sauvignon Blanc, Semillon, Muscat Blanc was harvested by Mastro Scheidt in 2016. No two seasons are the same and no two varietals are the same. My wines change with the seasons. Winemaking is not an exact science, it's subject to undiversifiable risk, known as Mother Nature. I'm showing the beautiful pics, the highlight reel. There's a lot, behind the scenes, the day in, day out unromantic reality of what I do with these grapes. 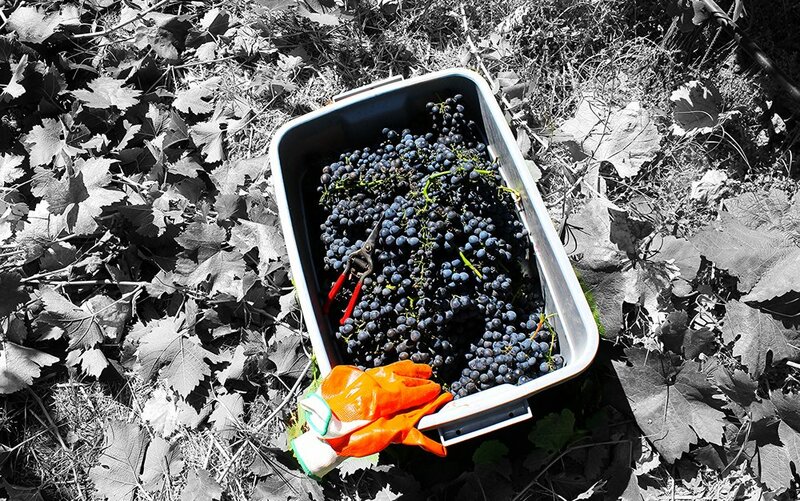 There are a lot of steps to get raw grapes from the field to the bottle. Enjoy the beauty of harvest. I may scare a few of you with this post. Making wine and making sausage have something in common. They are both dirty. 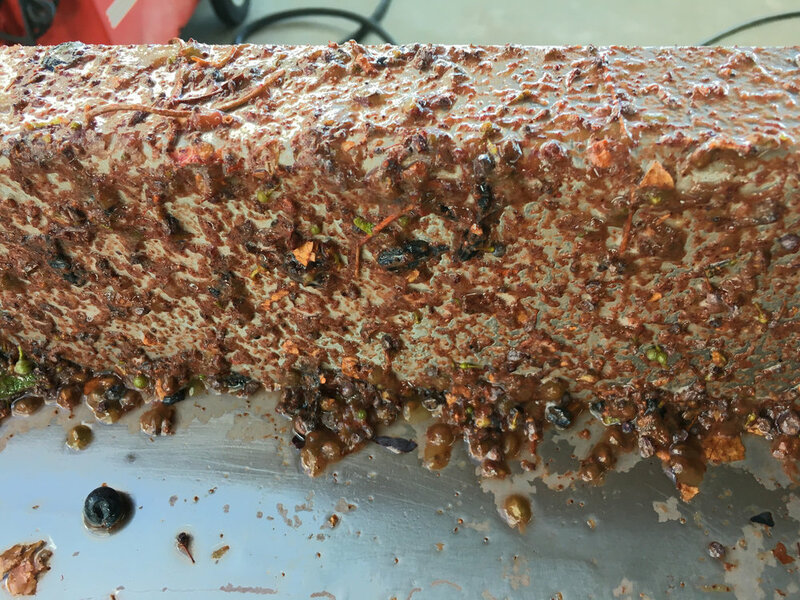 This post is about the realities of winemaking in pictures. 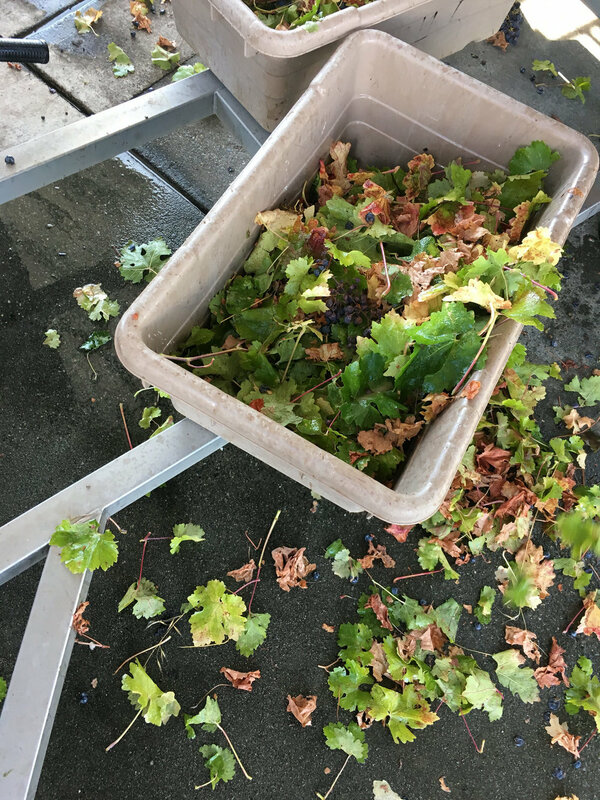 If you want to continue to believe that being a winemaker is glamorous, a dream job, where all grapes are picked "at peak ripeness to achieve a perfect wine on the perfect day", this post will likely be a shock to you. For disclosure purposes, all the pictures are mine, but all the processing in the pictures is not. I make wine at a facility with a wide variety of winemakers and styles. Each wine maker has responsibility for their own wine. 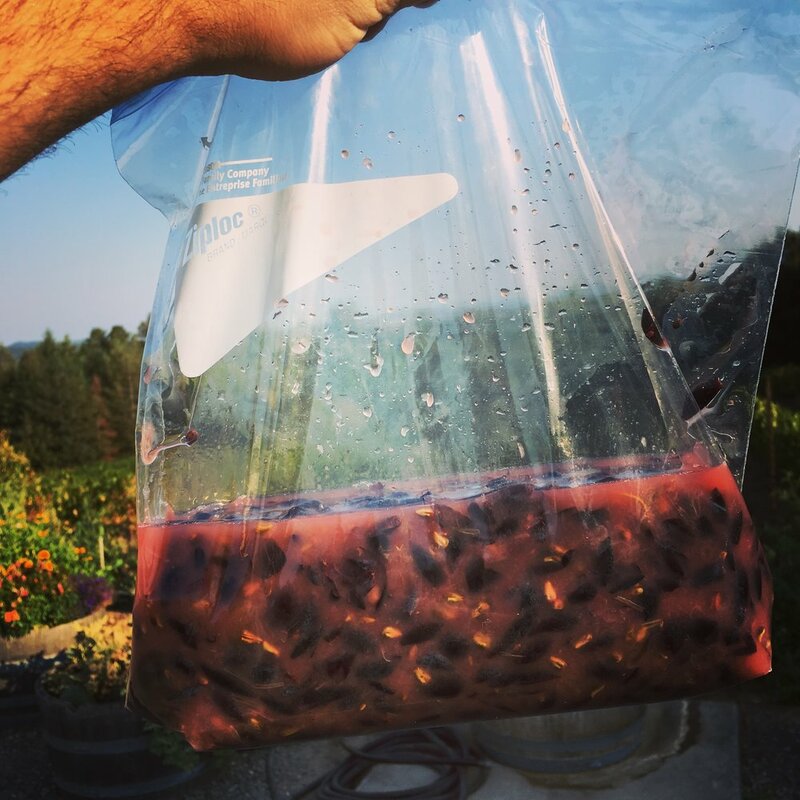 This blog is a daily journal of my experiences in wine making..
Making wine isn't easy work. It comes with power outages, broken equipment, people who don't show up, late nights, early mornings, wine stained hands, a filthy car, tired feet, and plenty of uncertainty; a.k.a it's a job. Not all the grapes make it and this is just one of the times they get washed down the drain. Grape must will stain everything it comes in contact with. More wasted grapes, but it's ok. There are a lot of seeds in this must. Don't panic, it's just water. Some wineries like to press their grapes really hard, this is the result. Moon rocks. When this hit the floor it sounding like pea gravel. Dried up press grapes after a winery presses really hard for extra juice. Grapes are found everywhere. Your car, home, lab, and on any flat space. Cleaning is essential. While performing a punch down of the fermenting cap, it's highly likely that you will splash some juice. Your clothes will stain. The farther away this waste is from the crush pad, the better. It's fruit fly bait. And now for the video. Sediment and lees are a fact of wine making. Period. They reside in all wines. What the end user sees in the bottle is the result of a long process to get a cloudy, sediment filled substance to market without flaws and wonderfully clear in the glass . To reiterate, this is not my wine. merely an example of cleaning after a barrel fermentation. "Each man delights in the work that suits him best"
The 2016 Harvest marks the first time the entire family came out to pick some grapes and see the process, from start to finish. 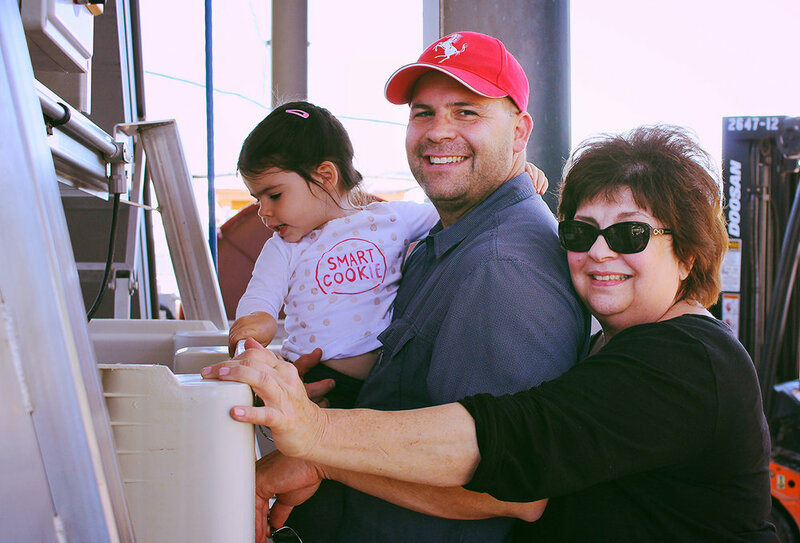 Three generations of family were on site to see what the harvest is all about. I love watching movie trailers. A good friend was at ComicCon updating me on what's coming out this year and next; lots of DC, Marvel and Disney (you know, the company that owns Star Wars) stuff. Not to be left out of the trailer game, The Scheidt Brothers, in association with One Take Productions (what we call ourselves when we produce a goofy video) put together a Harvest Trailer for this season. My brother and I have been doing these fun little skits since we were kids. And like many trailers, I wasn't afraid to embellish... a lot! Please be kind, it's my first video production. Remember, goofy video, serious wine. Enjoy!